You might think why I named it Orange "Passion"? I used pomegranate for this breakfast jar. A study conducted by the Queen Margaret University in Edinburgh has shown that pomegranate increases testosterone levels. It is a powerful, natural and effective aphrodisiac! Woohoooo! 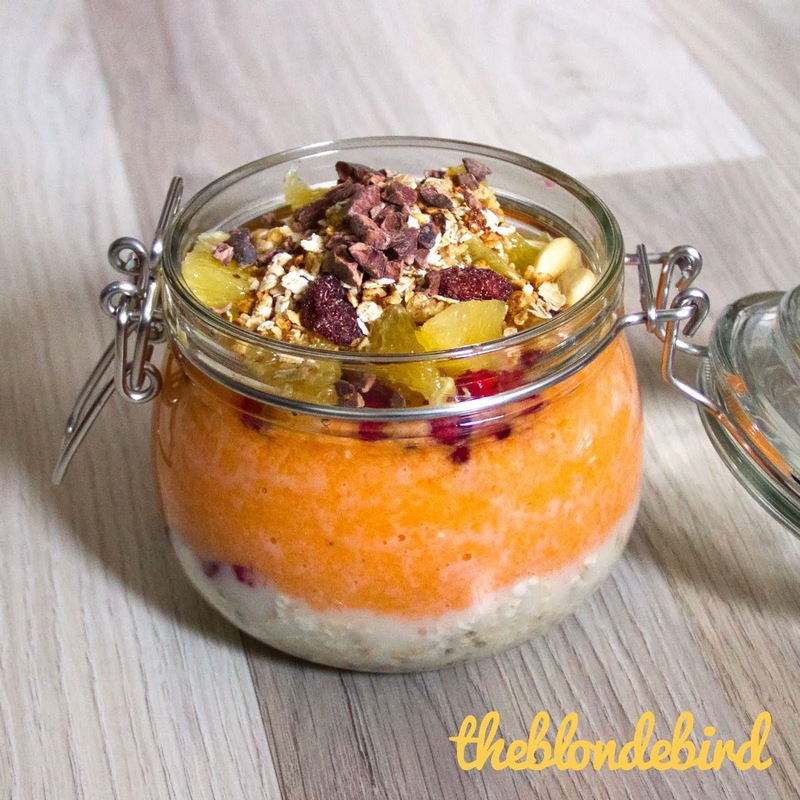 This jar is one of my first breakfast creations that will be available for delivery. COMING SOON! First layer is the oatmeal chia mixture. Pour half of the pomegranate seeds onto the mix. For the next layer blend carrots, banana and orange juice until smooth. It should be thick and creamy and not too fluid. Onto the carrot mix put the orange slices, rest of the pomegranate seeds, granola and cocoa nibs on top. Voilà! Die erste Schicht im Jar ist der Haferflocken Chia Mix. Dann kommt etwa die Hälfte der Granatapfelkerne darüber. Für die nächste Schicht gebt Karotten, Banane und Orangensaft in einen Mixer und mixt bis alles zu einem dickflüssigen Brei geworden ist. Das Ganze darf nicht zu flüssig sein! Den Karottenmix schüttet nun auf die Haferflockenschicht. Oben drauf kommen nun die restlichen Granatapfelkerne, Orangenfilets, Müsli und die Kakaostückchen. Voilà! tolles rezept!welchen mixer verwendest du denn? Danke! Ich verwende einen mittelpreisigen Standmixer von Superior.